Card Text Reap: Return a card from your discard pile to your hand. 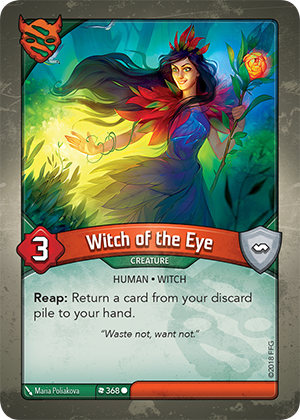 If I use Witch of the Eye via an action card ability (such as “ready and use a friendly creature”), can I use the Witch of the Eye’s “Reap:” ability to return that action card to my hand and play it again? No. An action card does not enter the discard pile until it is fully resolved. In this case, the action card would not be fully resolved until after Witch of the Eye is used (e.g. reap).